Since the beginning of the year, the state of Florida has reported one confirmed and one probable case of Creutzfeldt-Jakob Disease (CJD), and both cases are from Hillsborough County, according to state data. In 2015, 21 confirmed and eight probable CJD cases were reported in the state from 20 counties with three cases reported in Hillsborough County.The confirmed case was reported from Tampa in January, while a probable case was reported from Valrico, in eastern Hillsborough County last month. CJD is a rare brain disease that affects approximately one person per million people worldwide per year. CJD occurs when a normal brain protein changes into an abnormal form called a “prion” and accumulates in brain cells. CJD can occur sporadically, from genetic mutation, or it can be acquired. It is not easily transmitted from person to person. CJD patients have a range of neurological symptoms that get worse as the disease progresses. Symptoms may include: failing memory, difficulty with walking, blindness, and problems with common activities of daily living. There is no specific treatment or therapy that has been shown to stop the progression of the disease. There is currently no easy diagnosis for CJD. Physicians often make a presumptive diagnosis of CJD on the basis of the typical signs and symptoms and progression of the disease. I lost my mother to hvCJD (Heidenhain Variant CJD). I would like to comment on the CDC’s attempts to monitor the occurrence of emerging forms of CJD. Asante, Collinge et al  have reported that BSE transmission to the 129-methionine genotype can lead to an alternate phenotype that is indistinguishable from type 2 PrPSc, the commonest sporadic CJD. However, CJD and all human TSEs are not reportable nationally. CJD and all human TSEs must be made reportable in every state and internationally. I hope that the CDC does not continue to expect us to still believe that the 85%+ of all CJD cases which are sporadic are all spontaneous, without route/source. We have many TSEs in the USA in both animal and man. CWD in deer/elk is spreading rapidly and CWD does transmit to mink, ferret, cattle, and squirrel monkey by intracerebral inoculation. With the known incubation periods in other TSEs, oral transmission studies of CWD may take much longer. Every victim/family of CJD/TSEs should be asked about route and source of this agent. To prolong this will only spread the agent and needlessly expose others. In light of the findings of Asante and Collinge et al, there should be drastic measures to safeguard the medical and surgical arena from sporadic CJDs and all human TSEs. I only ponder how many sporadic CJDs in the USA are type 2 PrPSc? What if you can catch old-fashioned CJD by eating meat from a sheep infected with scrapie? Most doctors believe that sCJD is caused by a prion protein deforming by chance into a killer. But Singeltary thinks otherwise. He is one of a number of campaigners who say that some sCJD, like the variant CJD related to BSE, is caused by eating meat from infected animals. Their suspicions have focused on sheep carrying scrapie, a BSE-like disease that is widespread in flocks across Europe and North America. Now scientists in France have stumbled across new evidence that adds weight to the campaigners’ fears. To their complete surprise, the researchers found that one strain of scrapie causes the same brain damage in mice as sCJD. Submitted to: Scientific Reports Publication Type: Peer Reviewed Journal Publication Acceptance Date: May 28, 2015 Publication Date: June 30, 2015 Citation: Comoy, E.E., Mikol, J., Luccantoni-Freire, S., Correia, E., Lescoutra-Etchegaray, N., Durand, V., Dehen, C., Andreoletti, O., Casalone, C., Richt, J.A., Greenlee, J.J., Baron, T., Benestad, S., Brown, P., Deslys, J. 2015. Transmission of scrapie prions to primate after an extended silent incubation period. Scientific Reports. 5:11573. Interpretive Summary: The transmissible spongiform encephalopathies (also called prion diseases) are fatal neurodegenerative diseases that affect animals and humans. The agent of prion diseases is a misfolded form of the prion protein that is resistant to breakdown by the host cells. Since all mammals express prion protein on the surface of various cells such as neurons, all mammals are, in theory, capable of replicating prion diseases. One example of a prion disease, bovine spongiform encephalopathy (BSE; also called mad cow disease), has been shown to infect cattle, sheep, exotic undulates, cats, non-human primates, and humans when the new host is exposed to feeds or foods contaminated with the disease agent. The purpose of this study was to test whether non-human primates (cynomologous macaque) are susceptible to the agent of sheep scrapie. ***After an incubation period of approximately 10 years a macaque developed progressive clinical signs suggestive of neurologic disease. ***Upon postmortem examination and microscopic examination of tissues, there was a widespread distribution of lesions consistent with a transmissible spongiform encephalopathy. ***This information will have a scientific impact since it is the first study that demonstrates the transmission of scrapie to a non-human primate with a close genetic relationship to humans. ***This information is especially useful to regulatory officials and those involved with risk assessment of the potential transmission of animal prion diseases to humans. Classical bovine spongiform encephalopathy (c-BSE) is an animal prion disease that also causes variant Creutzfeldt-Jakob disease in humans. Over the past decades, c-BSE’s zoonotic potential has been the driving force in establishing extensive protective measures for animal and human health. ***In complement to the recent demonstration that humanized mice are susceptible to scrapie, we report here the first observation of direct transmission of a natural classical scrapie isolate to a macaque after a 10-year incubation period. 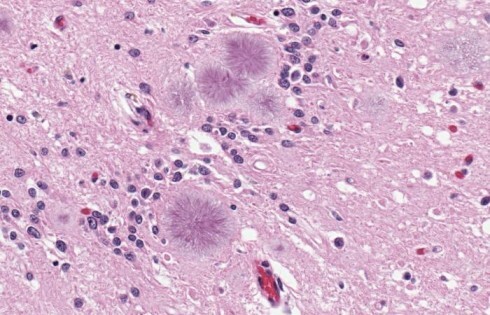 ***Neuropathologic examination revealed all of the features of a prion disease: spongiform change, neuronal loss, and accumulation of PrPres throughout the CNS. ***This observation strengthens the questioning of the harmlessness of scrapie to humans, at a time when protective measures for human and animal health are being dismantled and reduced as c-BSE is considered controlled and being eradicated. ***Our results underscore the importance of precautionary and protective measures and the necessity for long-term experimental transmission studies to assess the zoonotic potential of other animal prion strains.